The Stiga SC 80 AE 80 Volt battery-powered Chainsaw is a revolution in home woodcutting. Powerful, lightweight and efficient, it makes easy work of jobs around the garden. The SC 80 AE 80V Lithium-Ion battery powers a highly efficient DigiTorq brushless motor. You'll get energy and cost savings from this intelligent power-saving technology. Equipped with a 40cm (16") Oregon bar and chain that is easily adjusted: the chain is automatically lubricated from the translucent oil reservoir, making it easy to check the level. The SC 80 AE Chainsaw has all the safety features you'd expect and at just 5.1kg when fitted with the recommended 2.5Ah battery it's lightweight too, making it ideal for all users. 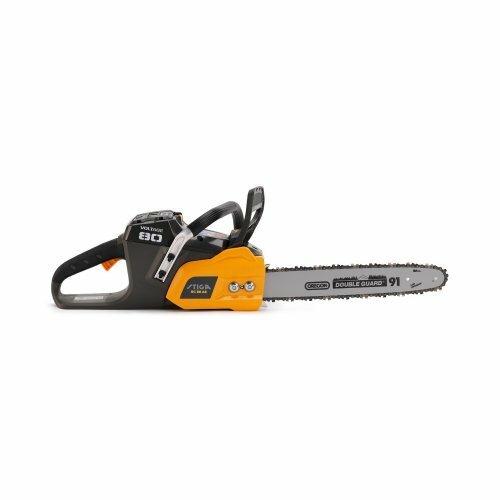 The reduced noise and fumes, incredible convenience, low cost and market-leading rechargeable 80V battery pack single out this chainsaw as a leader in its field. Only the 2.5Ah battery is recommended for the safe operation of this chainsaw and the harness should not be used under any circumstance.